The first parents’ meet for the academic year 2018-2019 of the students of Don Bosco Child Labour Mission, Davangere was held on January 03, 2019. In total 30 parents attended the programme and the rest 21 were not able to make it for different reasons. Fr Cyril Sagayaraj, Director DBCLM, was the chief guest of the programme. Fr. 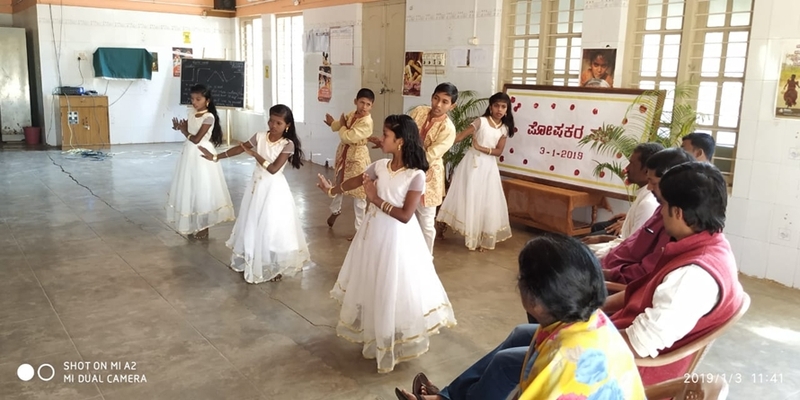 Jose Joseph, the administrator of the centre, Mr Sunil H, Coordinator, Open Shelter Project and Mr Lankesh and Mrs Chandramma, two representatives from the parents were present on the stage. Mr. Honappa, Social Activist in the Open Shelter Project welcomed all the guests of the day, parents and children. The programme started with a beautiful prayer dance by Hema and team. Mr. Dinesh, the Social worker in Open Shelter Project, in his introductory talk explained the intension behind this parents’ meet. He also mentioned how children are performing in their academic studies and in sports and other skills. He talked about certain documents to be got ready for their admission to the main stream education and about the selection of hostels and schools. The fifth class students have a possibility of writing an entrance exam and availing free education at Morarji Desai school. For this too some documents have to be got ready. Parents too must show some interest in the higher education of these children and take responsibility. Sangolli Subramanya and his team performed a skit on ‘alcoholism’. It depicted how alcohol consumption influences family ties and the loss of life and its after effects on the family. Mr. Lankesh, Niranjan’s Father, while speaking on behalf of the parents talked about his son. He was very poor in his studies and the teachers at Government School, Marikunte told him that his son is very poor in studies and he will not be able to continue with his studies. As he was very much worried about his son someone directed him to DBCLM and Niranjan made a lot of improvements now. He is very happy about his growth and his progress in studies. He also made a statement that he will follow whatever direction is given from DBCLM for his son’s better future and further studies. Mrs Chandramma, another representative from the parents, had her granddaughters studying in DBCLM. She felt that her wards were happy and they get a lot of opportunities to improve their talents besides the basic necessities like food and education. She was also happy for the love and concern shown by the fathers and staff at the centre. The centre has a friendly atmosphere and it helps the poor and vulnerable children. Fr Cyril Sagayaraj, the Director, briefed them on their responsibility. He exhorted them not to come for every feast and take children home for celebrations. It is true that children need care and love of the parents and so they must come and see them now and then. And also must follow up their studies and discuss with the teachers about the improvement that they are making. Once the children are taken home for holidays or feasts the parents must make sure that they return on time. Otherwise they will lose their interest in studies and become dropouts again. There are also some parents who never show any interest in the affairs of their children. They come only to get admission and disappear. If such parents are really in a bad condition to come and see their children at least they must phone up and enquire about their children. Some parents have not shown any interest to see the children’s growth. Those children deserve at least that much. Miss Jasmin was the Master of ceremony and she proposed the vote of thanks to all who were present at the end of the program. The whole programme came to its conclusion with lunch and individual meeting of the parents with the teachers.